The Rökkr can be described as the Nightside deities of northern European mythology, primal beings who predate the more familiar Aesir and Vanir pantheons. They are often the spirits of primordial concepts such as fire, ice, death, and the underworld, and can be compared to the Titans of Greek mythology, or the Nephilim of Semetic myth. Included in their number are Hela (goddess of death and the underworld), Iormungand (the world serpent), Fenrir (kozmic wolf), Loki (trickster god), Angrboda (mother goddess and teacher of seidr), Surt (fire giant), and Nidhogg (tellurian dragon). GRANDMOTHER NAL: Considers the significance of this polar goddess, the mother of Loki, and the grandmother of Hela. THE KOZMIC GAME: Understanding Rökkr kozmology as encoded within various traditional European board games. SOMEWHERE OVER THE RAINBOW: As well as being regarded as a classic of modern fairy tales, the Wizard of Oz has certain elements of a distinctly Rökkr nature. 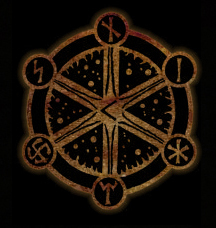 THE VOLUSPA: The Voluspa is a prophecy recited by Angrboda-Heid, which tells of both the creation of the world, and its end. It is important not only because it is given by Angrboda, the Rökkr mother goddess, but because of its great age compared to some other Norse texts. THE LOKASENNA: The Lokasenna is an important Lokian work, in which Loki attends a banquet of the gods and insults almost everyone in attendance. His insults, though, are not empty menace, but contain cutting truths.